Portrait painting poses challenges, especially when videoing the process. 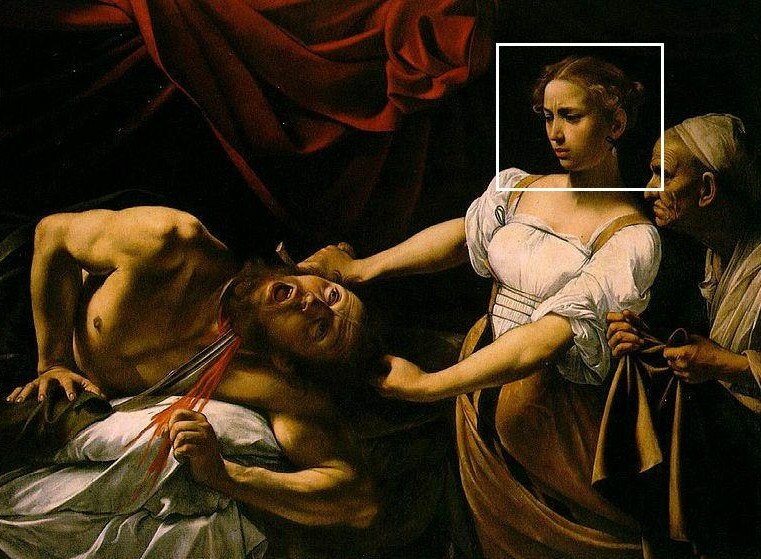 In this case, I opted for the Hebrew character Judith from Caravaggio’s painting ‘Judith Beheading Holofernes.’ This chiaroscuro painting tells a grisly story, but my real focus was Judith’s facial expression set against a somber background. Caravaggio’s grisly painting tells the story of Judith’s seduction and subsequent dispatch of Holofernes, an Assyrian general set out to crush the resistance against the Neo-Babylonian king, Nebuchadnezzar II. Judith’s home would become a casualty of Holoferne’s campaign if she had not decapitated him after getting him drunk. As can be seen here, Caravaggio used chiaroscuro to convey the dark atmosphere. Chiaroscuro, one of the painting modes of the Renaissance period is a painting style featuring dramatic lighting against a somber background. Numerous artists have painted this scene, including Lucas Cranach the Elder, Franz Stuck and Cristo Fano Allori. Several etchings and sculptures have also been inspired by the story. 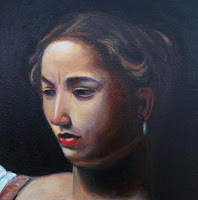 In Caravaggio’s interpretation, Judith wears a strangely faraway frown set against a dark background, one of the reasons I chose the painting for my video clip. The part I selected can be seen in the white square. Delicate yet dramatic chiaroscuro effects require high visual awareness. Even the slightest inaccuracies in the shadows around the nose, mouth or in Judith’s frown will make the face look wrong. When set against a somber background, the portrait also has to exhibit equally-dark shadows or the face will look washed-out. I completed the painting in 2 glazes and therefore 2 video clips (below). The first clip shows how I conducted the under-painting and first glaze, which will form the foundation for the overlying colors. The second clip shows how the second glaze was completed. Here, I applied burnt sienna and pthalo blue in various thicknesses to represent the shadow areas of the face. Being acrylic, the paint dries quickly. I then overlaid the underpainting with oil color. When applying paint in glazes, it becomes possible to modify the painting underneath. I began with the pale colors, mixing white with a little burnt sienna. This pale color was dabbed over the palest areas of the face, adding a little more burnt sienna and pthalo blue for the mid-tones. As the clip shows, I worked the paint generally darker as the face was painted in. Niggles may present themselves, such as the angle of the mouth. This is often due to difficulty in controlling the wet paint. I decided to leave these details for the next glaze. A day or two later, I worked on the second glaze. I added a little linseed oil for added transparency to the paint. White, a little burnt sienna and cadmium yellow were worked over the highlighted areas of the face, which resulted in more depth of tone. A separate brush for darker areas was dabbed over the shadows of the left side of the face. A fine sable was required for the eyes and mouth. Cadmium red and a little burnt umber were applied on the lips. Neat white was lightly brushed over the lower lip for highlights. I was able to modify the angle of the mouth here. Highlights were smoothly knitted into the darker areas via the midtone with a soft, clean sable. Blending forms an important part of portrait painting, particularly in oil. If a smooth blend cannot be achieved, a little additional oil paint might be needed to make the pigment go further. The portrait was finished off by touching up detail round the earring and the highlights on the hair. Creating depth of tone in chiaroscuro style requires a fair amount of deep colors. In order to set the tone, a dark-colored underpaint was applied. Once dry, I was able to key in the highlights of the face into the dark background. Niggles and rough blends may present themselves on this first glaze, but can be worked over on the second glaze. As can be seen in these 2 videos, the under-painting and the first glaze forms the foundations on which the upper glaze can be built, for smooth tones and depth of color.